Melodious but powerful Psychobilly that will enter your brain and never get out of it!! 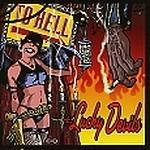 The Lucky Devils keep and improve their very own style on 9 original songs and 3 covers (B. Ryan, the Ramones, Blondie), with a clean but strong sound that will rock the crowd. Now its time for you to check them out....let them rock you or... "To Hell" with you!! !The Third Strike of the Devils! This album gets a cover drawn by Paskal Millet who also made Meteors, or P.P. Fenech's albums' drawings. TRACKLIST; Beautyful Stranger/Big Jean/ Tiger Man/Runaway Train/ Call Me/No Peace oF Mind/ Devils/Zero Zero U.F.O./Eloise/ To Hell/Websites Girls.